Sure thing Robert. I'll send you a SASE envelope when the time comes just pm me. I've never grown onions from seeds but would definitely give it a whirl. Last year we grew Georgia Sweet from sets from our local coop and they did really well. We wanted to try the Candy this year. Couldn't resist the way they looked in the Dixondale catalog. Intermediate onions will do well here. Wildcat, I have grown both the Candy Onions and Red Candy Apple Onions from Dixondale for a few years now. The candy onions are really good here. The Red Candy Apple onions are intermediate day onions. (They should be called Candy Apple Red, but they're not.) I have planted a lot of second year Red Candy Apple onions and some are already showing signs of going to seed. If you are interested, I can send you some seeds when they are ready. I'm thinking that Intermediate day onions should produce well in Kentucky. Are you sure these Candy onions are not hybrid?I didn't check and could very well be wrong but seems to me I remember Candy onion being hybrid.No idea about the red ones. Last edited by seaeagle; March 21, 2017 at 01:50 PM. I planted out Texas 1015Y this year because they're OP and they just as good. It has been fun growing onions from seed the past two years. The Red Candy Apple onion seeds http://www.dixondalefarms.com/produc...ate_day_onions "Dixondale Farms' exclusive since we are the only ones with the rights to the seed." They aren't telling if they are OP or hybrid. Park Seed says hybrid and 20 dollars for 60 sets.I can buy onions already grown for that price. I am assuming a set is one plant.Dixondale's patent must have worn off cause lots of seed vendors selling them now. Last edited by seaeagle; March 21, 2017 at 03:26 PM. Park Seed says hybrid and 20 dollars for 60 sets.I can buy tomatoes already grown for that price. I am assuming a set is one plant.Dixondale's patent must have worn off cause lots of seed vendors selling them now. The Parks site says they're hybrids. Look how small they are. hmm? Jung and Seeds n Such are using a different picture from the ones above. All agree they are hybrids. A set of onions is around 50 plants depending on size. After reading those sites and prices, maybe we should all sell onion sets. After finding out Red Candy Apple is/are hybrid, who knows if the F2 seeds would even grow much less produce. $1.79 for 100 seeds is cheap. I would go with that instead of trying an F2 from seed. I bought the red white and yellow bulbs this year, mixed 100 bulbs for about 2 dollars at Wally World.They are even cheaper at the local Southern States but they don't mix them. 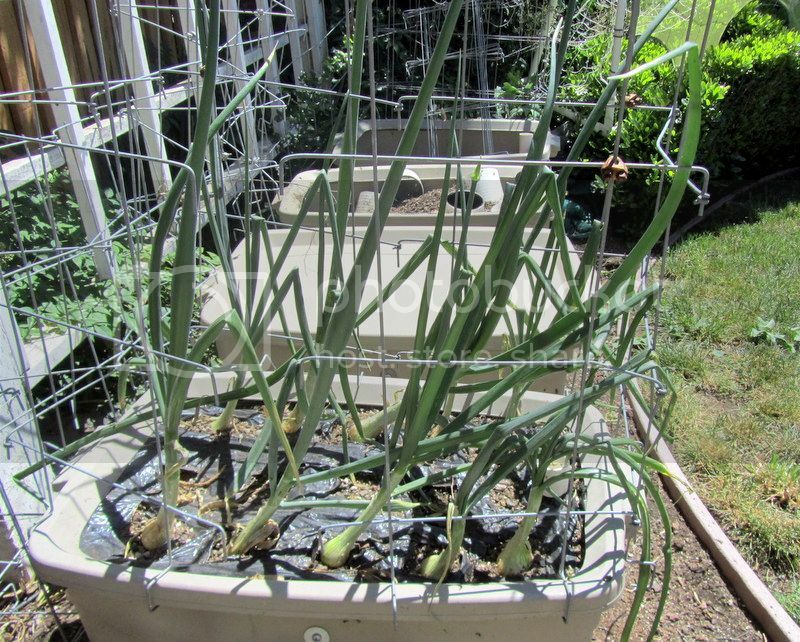 What I found out last year is onions grow great in containers and are much easier to care for. I planted about 30 in the ground and the rest in containers. Onions do look like a high profit margin business. you can get the same dixondale sets from morgan county seeds for $2 per set. mine where pretty small thought not sure if i got unlucky. bought some from gurney which im sure is dixdale plants as well but these where much larger plants and look much better then the once i got from morgan county. It would appear that I transplanted the seedlings much too deep in the soil. Oh well, a lesson learned for next year - - they do smell great drying out on the deck! There you are! I just posted that you're one of the people I'd like to see posting again. rnewste, The first picture looks like you planted them at the right depth. I looked up Campbell CA, and it looks like you might need to plant Intermediate-day onions. 1015Y is a short day onion that should do well planted southern CA. Upper CA needs long day onions. Onions are fickle on where you grow them. 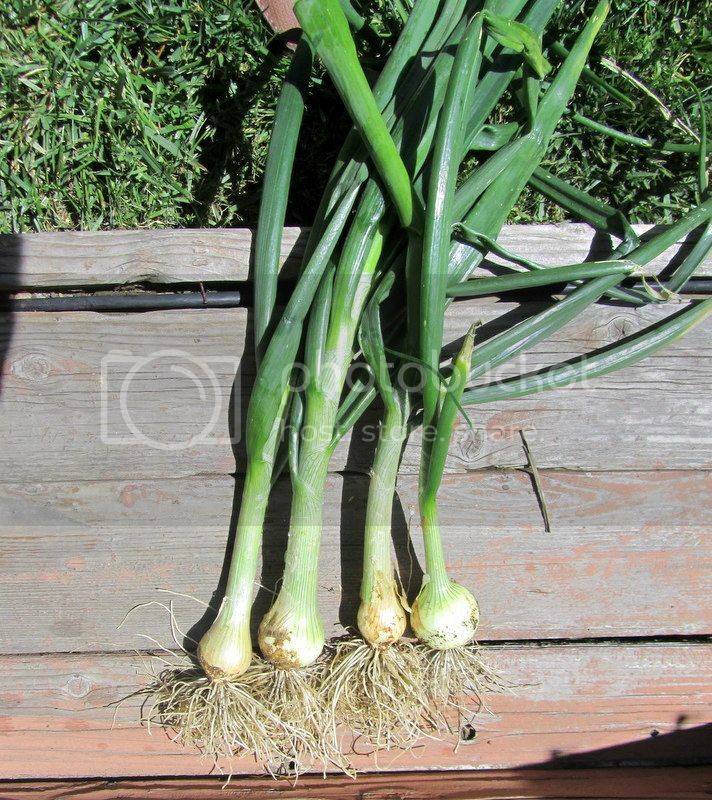 I grow short day onions, but have tried Intermediate-day onions that just don't grow very big for us. I'm going to do more research on this, and will get back with you on what I find. Not even close to being ready to pull, count the leaves, they wont even start to bulb up yet this time of year. I bought Candy onion seed from Park and planted them in January - I missed the smell of potting soil in the winter and couldn't bring myself to pay the Dixondale price for plants. I used to just get the sets from Walmart . . . which were the wrong onions for an intermediate day state! For the first year, I planted the right kind of onions. I ran across some Candy red plants in Harrisonburg and picked them up. They had suffered through some pretty cold temps but are starting to put on some heft. I'll go with seed again this next year. The seed can be planted when nothing else is growing and the plants planted out way before the warm weather seedlings need any attention.